The mission of the VUIIS Research Radiochemistry Core Laboratory is to help Vanderbilt Investigators (1) develop and translate novel radiopharmaceuticals to patients, (2) non-invasively visualize and quantify molecular events in preclinical in vivo models and patients, and (3) conduct clinical trials that feature molecular imaging endpoints. 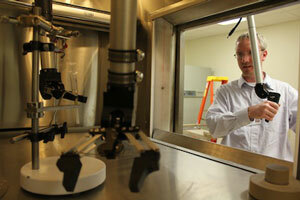 The Radiochemistry Core also operates a dedicated SPECT isotope labeling facility. This lab has been equipped with an activated charcoal filtered hood for the manipulation of iodine isotopes and has been outfitted with the latest equipment for the purification and identification of the compounds being prepared. The PET-Chemistry Research Lab is connected to the GE cyclotron through lead-shielded lines allowing direct delivery of [18F]fluoride or [11C]carbon dioxide to shielded "hot cells" for production of radiotracers.